Illinois is offering $100 million in state funds to finance low-interest or interest-free loans to federal workers going without pay during the record government shutdown, officials said Wednesday. Democratic Gov. J.B. Pritzker and Treasurer Michael Frerichs announced that eligible federal employees will be able to visit participating banks for the loans. 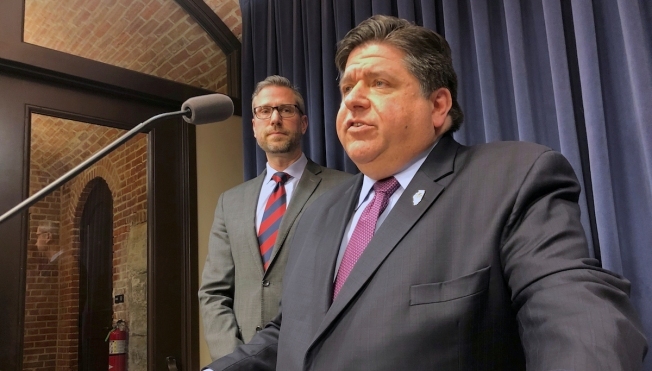 Pritzker also said he's exploring some of the more aggressive approaches that his counterparts across the nation are taking to help the affected households. Government employees, including approximately 8,000 in Illinois, are not getting paid because of the partial shutdown brought about by Republican President Donald Trump's battle with Congressional Democrats over his request for $5.7 billion for a U.S.-Mexico border wall. Many employees — such as Transportation Security Administration workers — are expected to be on the job despite not getting paid. "Missing a paycheck or two, or maybe more, with no end in sight has real consequences," Frerichs said. "Rents are at risk, mortgages, tuition." The money is coming from liquid portions of the state's $12 billion investment portfolio, Frerichs said, so there's no impact on Illinois' day-to-day finances. Two dozen financial institutions have agreed to take part so far. They'll take the state deposits to dole out loans. The governors in Michigan, New York and Washington last week asked the Trump administration for permission to pay unemployment benefits to all those affected , including those who are still working. They said if that request is rejected, the Labor Department should work with Congress to change the law. Democratic California Gov. Gavin Newsom said last week he would provide benefits to those reporting to work regardless of Washington's objection. Asked about following suit, Pritzker said, "We're looking at all the possibilities." The governor favors border security, calling for "comprehensive" immigration reform. But he derided Trump's stubbornness over what he termed an "unnecessary wall." "It's not just Democrats affected by this shutdown. Republicans are being affected all across the nation, all across the state of Illinois," Pritzker said. "It doesn't matter what political party you belong to, people are being hurt, and it shouldn't be that in order to get some political end, we're hurting everybody in the nation."